For those of you who haven’t been by to see the remarkable renovations in Bend’s Pioneer Park, it is a must see as the Bend Park and Recreation District and the contractors involved have done a great job of making a good park great. An appropriate place to start descriptions of Pioneer Park is at the new handicapped accessible ramp near the Portland street bridge on the south end of the park. The ramp pictured below is very tastefully done with a lava rock facing and very sturdy and timeless iron railing. There is a pedestrian crossing underway so that walkers and runners can cross Portland avenue with some level of safety. There is also work going on in Pacific Park on the other side of Portland Avenue. A graded, handicap ramp is in place there as well, but it currently doesn’t really connect with anything, except a goose poop laden wood chip path. 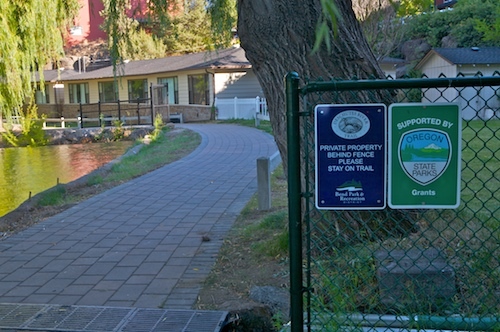 A Bend parks and Rec employee I spoke with said that it was his understanding that a path through Pacific Park would be eventually be completed, thereby connecting to the core of downtown Bend with Pioneer park through the ever developing Bend River Trail system. Back to Pioneer Park and its lovely new paver walkways. Walking north along the gently flowing Deschutes River, along the freshly minted walkway is one of the more underrated views in Bend. 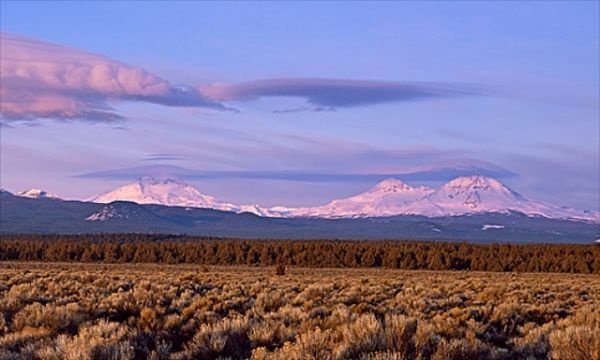 Awbrey Butte seen over the placid waters of the Deschutes River is an impressive scene. Beyond this point is where the real benefit of this renovation start to shine through. 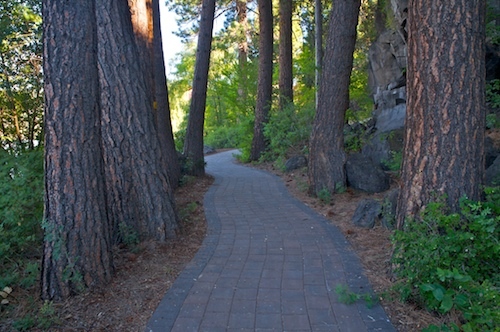 The path ambles through large ponderosa trees, rimrock lava formations, and along the banks of the Deschutes. I’ve been to Pioneer Park many times before as it is close to the Bend Wild compound and this is where the trail used to get a little creepy. Makeshift homeless camps with lots of garbage could regularly be found in this area of Pioneer Park. Well, not any more. 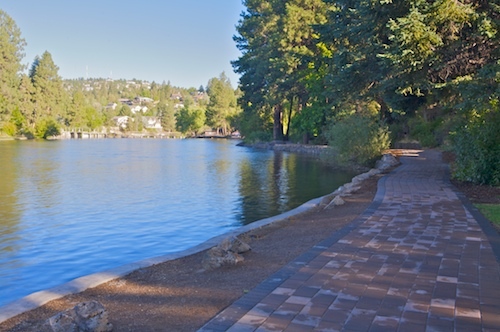 The beautifying of the trails and parks via this renovation have brought in more walkers,runners, and foot traffic, thereby driving out the homeless individuals who were intimidating to the rest of Bend’s park users. This is actually a good example of increased traffic through an urban trail system making he trails much safer and more beautiful. With these wonderful improvements, this area of Pioneer Park really does have a magical feel, which is an immense improvement. Continuing north beyond the rimrock area, travelers come upon an apartment building located along the river’s banks. I’m certain that the city of Bend had to do some serious negotiating to get access through this property and it is well worthwhile for everyone involved. 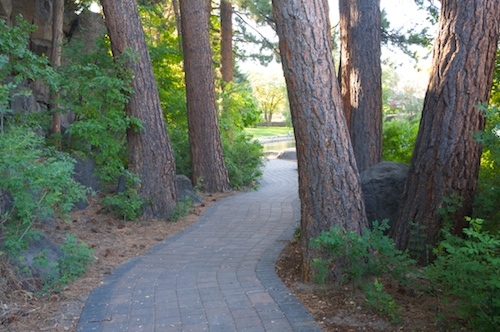 Having this elegant walkway is a phenomenal resource for all the citizens of Bend, and it adds value to the apartments which are located nearby. The path and amenities are top notch in this area with low maintenance and long lasting concrete fences and black iron safety fences. During the constructions process I noticed the men form Mike’s Fence Company working on the concrete fencing. Well done guys! 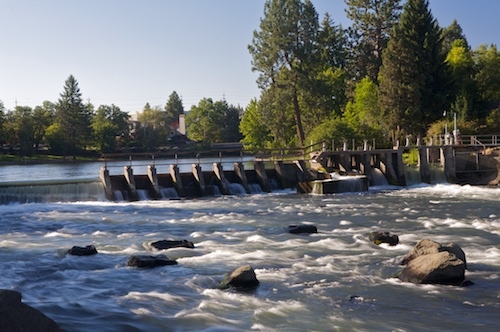 Adjacent to the apartments, is the dam which holds back the Deschutes River. Below the dam, the Deschutes river takes on a much more rugged personality. This, incidentally is where the “First Street Rapids” area of Bend is located.the dam which makes the water under the Portland avenue bridge so placid. 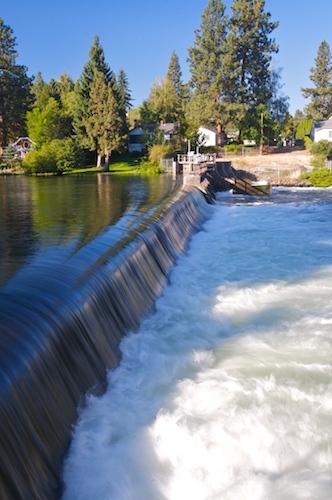 Downstream from this dam, the Deschutes River takes on a much more rugged personality. 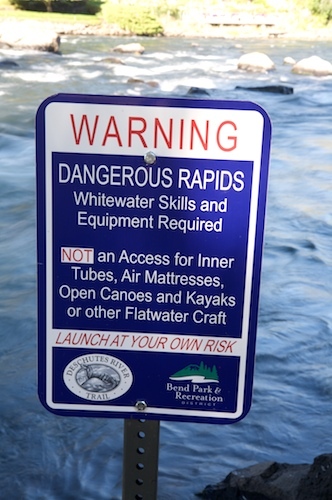 Slightly downstream from the dam is a “put-in” spot for whitewater kayakers. Foot access is available from Pioneer Park. The “put in ramp” is safe looking and lined with fine gravel. Please head the ominous warning sign at the white water “put-in’ area which is seen below. 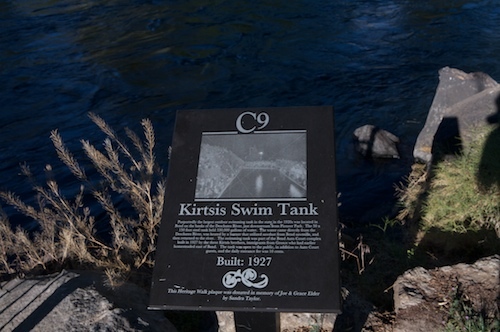 Historical plaque about the "Kirtsis swim tank"
Shortly beyond this point, the pavered path unceremoniously ends. There are trails criss crossing this area but it is definitely undeveloped. 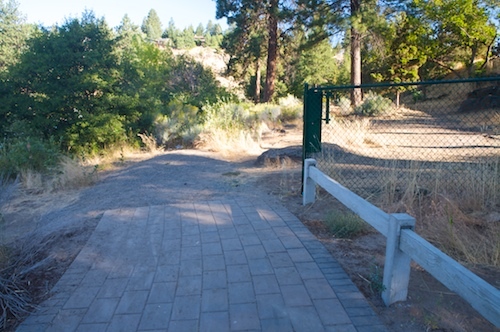 This temporary ending point of the Pioneer Park walkway is on City owned property and it is the proposed area for a pedestrian bridge across the Deschutes River. 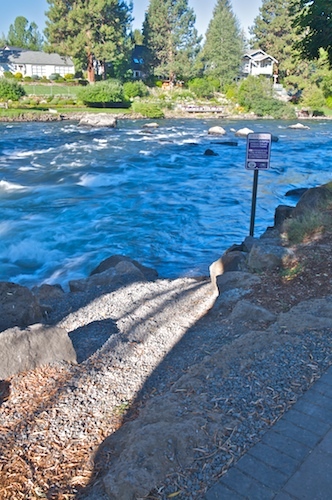 Temporary end of the Pioneer Park walkway, which is located across the Deschutes River from First Street Rapids Park. 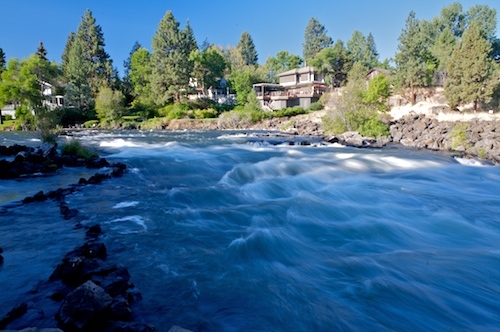 With a short stroll, you will find the famed First Street Rapids and a couple of wading pools along the banks of the Deschutes River. First Street Rapids. 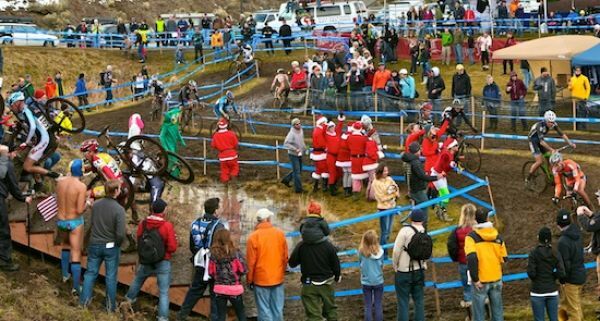 Bend, Oregon. 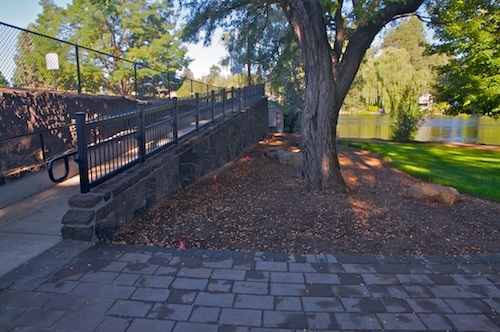 While the improvements to Pioneer are excellent, they are nothing compared to the benefit that the residents and visitors to Bend will enjoy once the First Street Rapids bridge is completed, thereby connecting Pioneer Park with the First Street Rapids parks and the Deschutes River Trail on the west side of the River. The length of the River Trail will be much more accessible with the completion of the proposed bridge, and many walker and runner friendly loops will be possible with the bridge intact. We can envision a few standardized and easy to follow loops clearly marked for enjoyment of visitors and residents alike. It would be a beautiful and simple activity for everyone on the downtown Bend area. Alas, we will have to wait for funding, but when it does happen , Downtown Bend will have another brilliant and natural calling card. This is truly the type of infrastructure that would help pull Bend out of its current economic doldrums. Because a loop walk is not currently available on this area of downtown Bend, an out an back is the only option. On the way back to Pioneer Park there are some more beautiful views including the following view of the First Street Rapids dam. If you look closely, you can even see a fish ladder that will hopefully someday allow passage for salmon and steelhead to pass upstream to Mirror Pond and eventually the Upper Deschutes River. 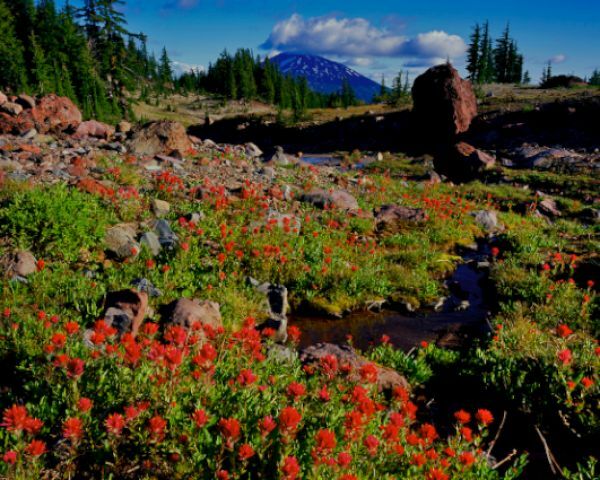 For more information about the “back to home waters” initiative, being spearheaded by the good people at the Deschutes Land Trust, follow this link, “Back to Home Waters”. How cool would it be to see and know that anadromous fish were passing through and spawning in Downtown Bend. Just another thing that could make our favorite city even better! Upstream from the First Street Rapids dam is another idyllic view that was made possible by the renovation of Pioneer Park. 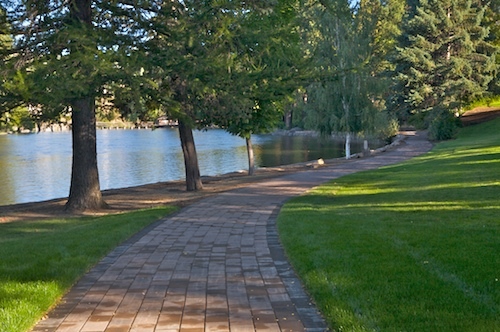 Path in Pioneer Park, Bend, OR. While the renovations of Pioneer Park are great, the park did have a lot to offer before the recent improvements. 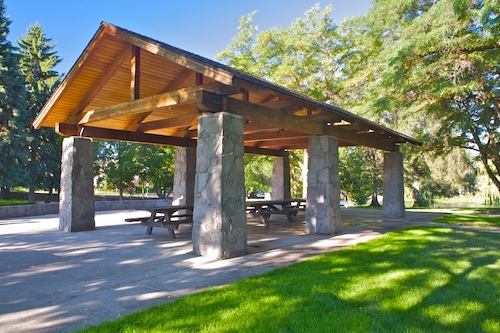 The picnic shelter seen below is often utilized for weddings and other organized get togethers. It is an attractive facility with great views, and an awesome location. Pioneer park also has an attractive garden area above the rimrock on the northern end of the park. 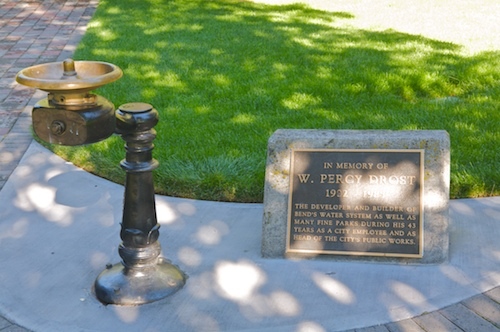 This particular area is dedicated to Percy Drost, who developed and built Bend’s water system and several of its parks during his tenure with the Bend Parks department. -Awesome new renovation! kudos to the Bend Parks department and all the contractors involved. -Pioneer Park is much safer and Happier now. -Someday, the park may include a bridge that connects Pioneer park with the First Street rapids area. 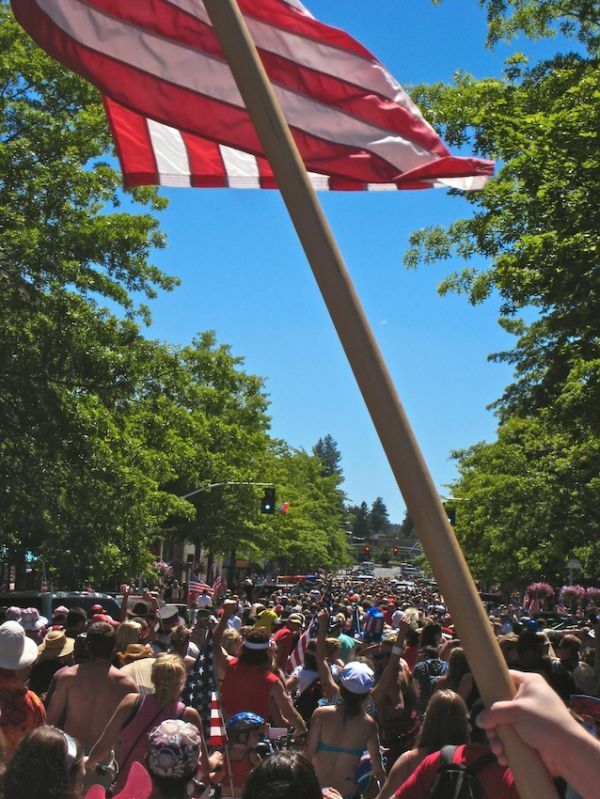 This will be HUGE for the city of Bend! 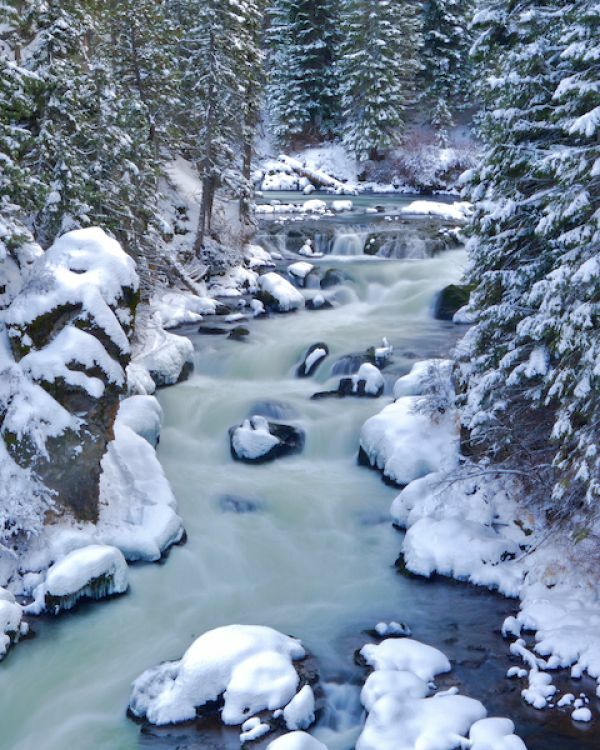 -Someday you may see salmon and steelhead swimming through this area of the Deschutes River. How cool would that be? That’s all for now! Go check out the new renovations at Pioneer Park. You won’t regret it! Wow. Thank you. Beautiful pictures and descriptions. One minor correction is that Bend Park & Recreation District is a separate entity from the City of Bend unlike in many cities where parks and recreation are a department. Voters separated the two in 1974. I noted your comment, made corrections and added a link to the Bend Park and Recreation District Website. Thanks you for the correction and more importantly thank you for the wonderful improvement in Pioneer Park. Is there any time frame for the proposed bridge to the First Street Rapids Park? Regardless, Thanks Again. Great article! The photos are beautiful. Would you grant us permission to use them, for instance on our website? Thank you, the BPRD planning department. Thanks for your kind words! We’re glad you found us. 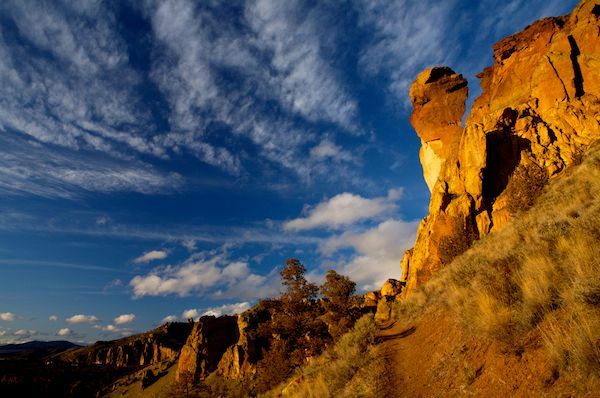 Keep checking back as we plan on doing more features about the wonderful parks in and around Bend. Also thanks regarding our photography. We take pride in it and your compliments are wonderful to hear! We do have some very fine parks in Bend! I was on the technical committee for Mirror Pond. I wonder what’s happening in the progress of that issue. It would be helpful if you had mentioned the distance of the walking path, i.e., one mile, 1.5, 2.0, etc.